One day this week when I picked my son up from school he had a plate full of cookies that he made in FACS (Family and Consumer Science a.k.a. Home Ec.). He was so proud of them! My first question to him was, “Do you want to take pictures and blog about your cookies?” I was a little disappointed that he nixed that idea. Oh well. So instead I bring you Cinnamon Chocolate Chip Scones. I don’t know why I don’t make scones more often. They are so easy, so yummy, and there are so many wonderful scone recipes to try. 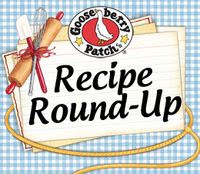 I had not tried this recipe before, but it is now on my list of favorites. My husband in particular loved these. He had one for breakfast. And lunch. The scones did turn out more muffin-y than biscuit-y, if that makes any sense. What I mean is that they were not as light and flaky (like a biscuit) as other scones I have made. The texture was a little more dense, yet still moist--almost like a muffin. This could be because of the sour cream, or because I over-mixed my dough. In any case—yummy! 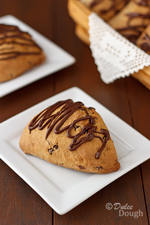 Perfect with a cup of coffee--cinnamon flavored scones filled with miniature chocolate chips and drizzled with chocolate. 1. Preheat oven to 375°F.2. In a large bowl combine flour, sugar, baking powder, cinnamon, baking soda, and salt.3. Using a pastry blender, cut in butter until mixture resembles coarse crumbs.4. In a medium bowl, beat together the eggs, sour cream, and vanilla.5. Add the wet ingredients to the dry ingredients and stir until a soft dough forms; stir in chocolate chips.6. On a lightly floured surface, knead dough until smooth--about 1 minutes.7. Form dough into (2) 6-inch circles and cut each circle into 6 wedges for a total of 12 wedges.8. Place wedges onto a lightly greased baking sheet and bake for 25-30 minutes or until golden brown.9. Cool slightly on a wire rack; if desired melt additional chocolate chips and drizzle over scones. These sound yummy, I love making scones, I don't know if it's the shape or what but I just feel special when I bite into a scone. Pinning! I always tell my students if you're making a cake for people but it falls then call it a torte. No one will know the difference except you, and as long as you have good ingredients it should still taste wonderful. I think your scones look fantastic and obviously your husband thinks so as well. By the way I like how you've changed your blog. It's very nice. I'd like to do some updating as well. Thanks Vicki! So I guess I could call these triangular muffins! These look yummy!!!! Julian always wants to post what he makes lol. I've been totally trying to figure out what type of scone to make for my friend who just had a baby.... and these sound perfect. I'm sorry your son didn't want to blog about his cookies but these scones are gorgeous. I absolutely love making scones, and I have all these cinnamon chip scones to use up so this is absolutely perfect. I am a huge fan of scones, especially ones with cinnamon. These look so fabulous, Jill! Wow, these scones look great! This is one of the most perfect scones I have ever seen. Never tried a chocolate scone before, but chocolate AND cinnamon?! Woe, that's like a double whamy of great ingredients, I love it! I haven't made scones in a while.. too long while :) I would love to try your recipe. They look scrumptious! Add chocolate and cinnamon and you've got a yummy treat! Chocolate and cinnamon do make for a tasty combo. Not sure what kind of cookies your son had, but I am delighted with these scones. I love that last picture because it really shows off all the goodies inside as well as that great texture. Delicious creation! Me encantan los scones de canela lucen absolutamente bellos y tentadores,abrazos hugs,hugs. Jill scone is the one I won't able to get correctly till now. Sure I will try this one. And now I'm wanting scones. :) Like you, I don't know why I don't make them more often. Maybe because I know I'm the one that'll be eating them all? These sound so good! I look at these lovely scones and I can taste the smooth chocolate melting on my tongue followed by the cinnamon satisfaction of the scone! Must have these with my coffee...Fedex, please! I love making and eating scones. These look perfectly yummy! Love your yummy scone, Jill. So unusual with the chocolate drizzle...but then I'm such a lover of chocolate I would probably drizzle some on there, myself. Would love to have one right now with my morning coffee! Oh...chocolate chip scones, never try something like that. Well, my family just like savory scones, but I love the sweet ones, I have to try this. I've never made scones yet. Looking at your chocolate chip scones I am thinking I need to try making it very soon... my kids will absolutely love this and I can see their happy face... Thanks for the recipe!! My daughter discovered scones a few years back and has only found a few she hasn't loved. I"d put these right up there at the top of her list! You are amazing, Jill. And so are these scones! I wouldn't mind trying the recipe with blueberries maybe? Jill, you're amazing. Not only are the scones beautiful and so delicious looking, but your photo composition is just divine. I'm looking forward to baking like you! Jill these look absolutely lovely! Cinnamon and chocolate is such a clever and unique idea! And you make them look so pretty! I'm going to attempt (and probably fail :/) and then get Lou to try to make them. When are you opening a bakery? !